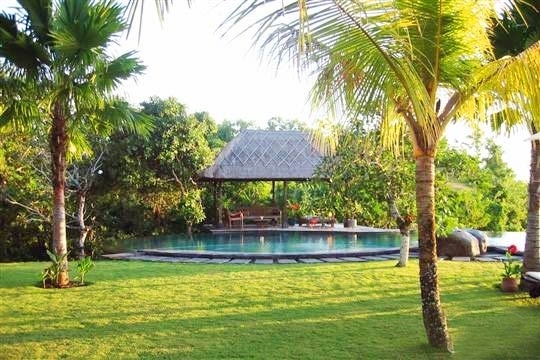 A truly stunning 4-bedroom property with glorious gardens above a renowned white-sand surfing beach, Villa Pemutih beckons with an infinity-edge cliff-top swimming pool and spellbinding views of Bali’s dramatic coastline. The experience is completed with a team of friendly staff and the inclusive services of a car and driver. They call it ‘Impossibles’ – an isolated beach somewhere on Bali’s extreme southwest coast. It was given this moniker by the foreign surfers who ‘discovered’ it in the 1970s. Virtually impossible to access back then, with a potentially impossible, barrelling reef break that still challenges professional wave riders today, this white-sand cove was later acclaimed as one of the top ten surf spots in the world. 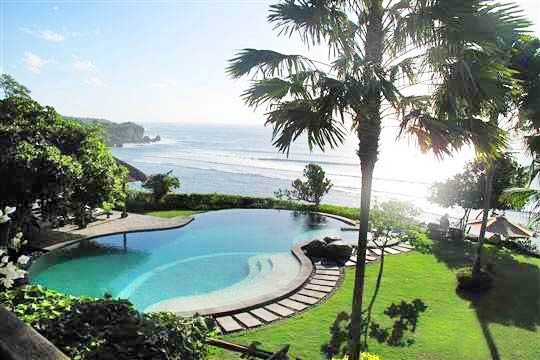 To the locals, the beach is known as ‘Pemutih’ and the same name has been applied to the spectacular four-bedroom villa that rests upon the cliff-top, 70m above. 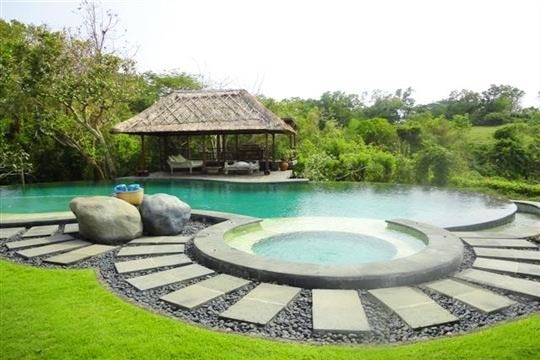 From here, the panoramic vista of the crashing ocean waves and – on a clear day – the volcanoes of Bali’s heartland, is outstanding, while the thoughtfully positioned spots that the villa offers for the viewing thereof are almost too numerous to mention. Sunloungers on the lawn, a secret balé relaxation pavilion partway down the cliff, an alfresco dining gazebo and another balé beside the pool, not forgetting the pool itself, as well as the balconies and the terraces that wrap around both floors of the main building. 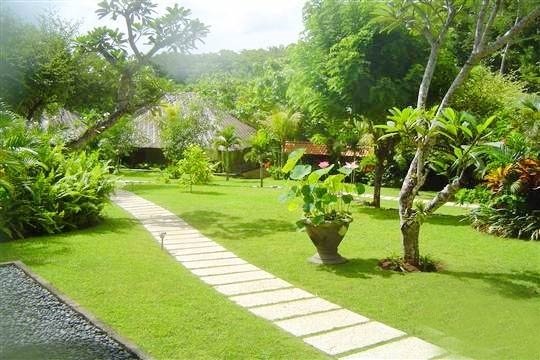 Blessed with oodles of land that has been lovingly tempered into a verdant garden, Villa Pemutih is a place of endless possibilities. The wide lawns are dotted with many unusual varieties of flowering trees and other tropical blooms; in this nature lover’s paradise, birds, butterflies and dragonflies flit, flutter and hover about the boughs and ride the thermals up the cliff. There is also a twitter of colourful parrots, lovebirds and cockatiels living in three aviaries in the grounds. The magic of Pemutih is complemented by a team of thoughtful staff including security, a driver, cook, housekeeping and waiting staff who will cater to all the needs of their guests – whether a road-tour of the local area, sunset cocktails in the cliff balé, or a Balinese feast in the open-sided dining pavilion. The groceries will be purchased by the staff (on guest account), and a suggestion menu is provided. 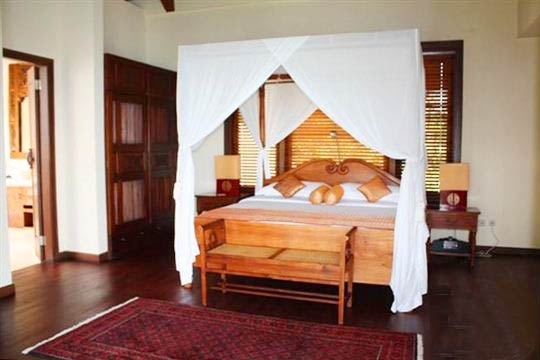 The villa’s bedrooms and alfresco bathrooms are all large, comfortable and similar in design, making Pemutih perfect for groups and almost impossible to leave. 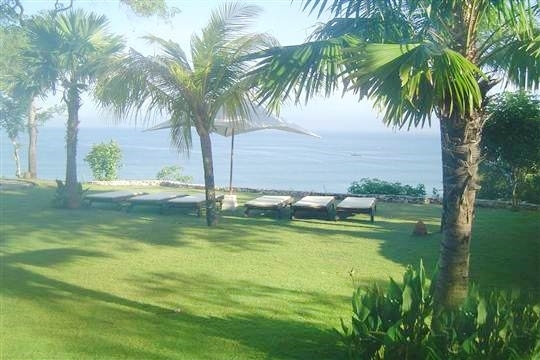 Panoramic vistas of crashing waves and – on a clear day – the volcanoes of Bali’s heartland. 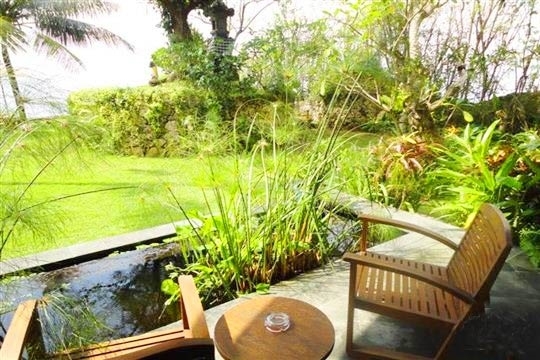 It is easy to become a little blasé when it is your job to stay in paradise holiday homes and report back on the findings, but walking into the gardens of Villa Pemutih and seeing that breathtaking view was a rapturous moment, and we knew that the next 24 hours was going to be blissful. And so it was straight to the pool and the sunloungers on the cliff’s edge with a cold drink, a good book and some sunscreen. A cleverly placed tree provides the shade, while the birds, the cicadas and the ocean provide the music. The sweet Balinese staff bought us cold drinks as the afternoon wore on, and we watched the sunset from the cliff side balé. In the evening, a delicious Balinese feast was cooked for us by the talented kitchen team. 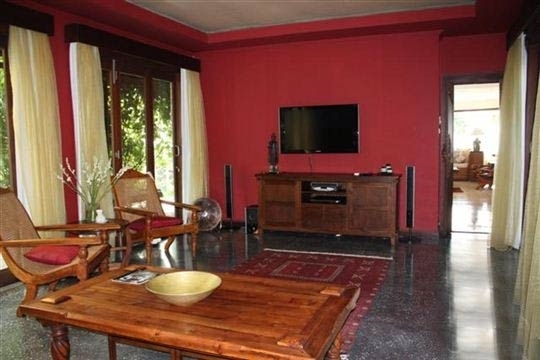 We then retired to the super-comfy studio room to blast ourselves senseless with a couple of movies on the villa’s explosive home theatre system. When the tide is low, do make your way down the cliff to the exposed reef for a bit of beachcombing among the rock pools. The water is calm and none too deep making it a fun, and safe, option for a paddle in the sea. Kids will also love the size of the villa grounds, where they can run around to their hearts’ content, and they’ll enjoy watching the birds in the aviaries. There are numerous species of trees in the garden, including flamboyant, frangipani, coral tree, custard apple, orange flowering saraca trees, acacia, cactus, mango, teak and yellow coconut. The views from the beautifully landscaped gardens and villa will exceed all of your expectations; we felt truly privileged to be there. Relaxing beside the pool with the sights and sounds of the sea, kingfishers and dragonflies, and a whole host of sweet-scented flowering tropical trees doesn’t even begin to hint at the feelings you will take home with you. We slept in the master bedroom upstairs and marvelled at the semi-alfresco ensuite: there’s not many bathrooms where you can take a shower or sit in a bathtub for two and have a magnificent view of surfers riding the waves on one of the best surf breaks in the world. At the time of our visit (February 2011) there was a big five-star resort (Anantara Uluwatu Resort) under construction immediately next door. The workers cranked up their heavy machinery at 8am, but to be honest, the noise was pretty much kept to a low and constant hum and we didn’t find it to be particularly intrusive. In fact, the onshore sea breeze blows it in the other direction. 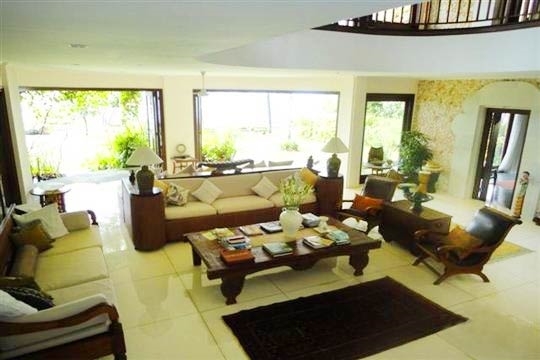 The project is slated to finish in mid-year 2011 but even then, due to the aspect of the villa, it will not impede on the views or allow the hotel’s guests to stare down into the villa or its garden. 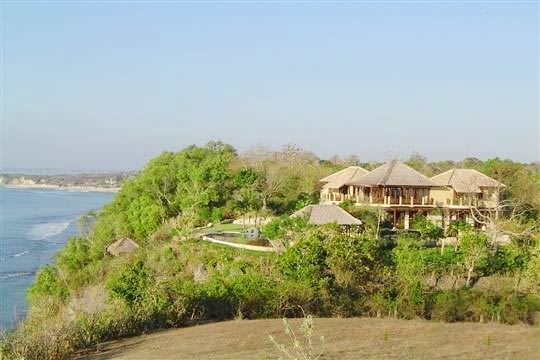 Villa Pemutih is, and will remain, very private. The upside of this building project is that there will soon be a fine dining restaurant and spa on the villa’s doorstep. Just a stunning location and the sunsets from the pool are breathtaking. We had the most relaxing stay and loved the pool, the massages on the front lawn and the food was amazing. Thanks for a great stay! 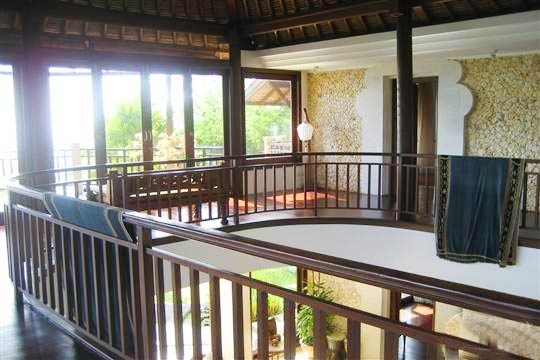 The villa is situated in the small village of Labuan Sait, close to Uluwatu on the south west coast of The Bukit Peninsula. A flight of 120 steps carved into the cliff will take you down to Pemutih Beach, also known as Impossibles – a world class reefbreak, which is a Mecca for surfers. There are strong currents and big waves here and the golden sandy beach is narrow at high tide, but at low tide it is full of rock pools. There are a couple of surfer hangouts on the beach, where it’s sometimes possible to get a cold beer or a nasi goreng (fried rice). A few other luxury villas and small hotels dot the cliffs along this coast but apart from some simple restaurants there is little else in the immediate area. Next door to the villa, construction of the Anantara Uluwatu Resort is scheduled to be completed in June 2011 (best to double check this information as building projects often take longer than anticipated). On completion, it will present three restaurants, bars, spa, gym and other facilities. 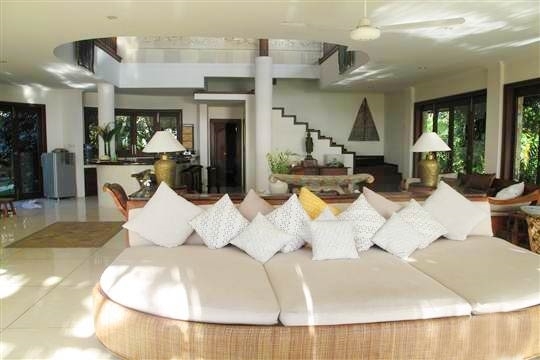 Villa Pemutih is a contemporary Balinese, two-storey house with bow-shaped walls and a random rock façade crafted in local limestone in harmony with the many rockpools on the beach below. It is characterised by terraces and thunbergia-draped pergolas, balconies, lily ponds, and floor-to-ceiling glass doors. The living room sits in the heart of the villa, presenting a big daybed at the front, which faces the wide open doors, and looks out over the ponds, swimming pool and garden to the million-dollar vista beyond. Fan-cooled and wired for sound, the room also incorporates a semi-circular corner bar kitted out with a fridge and high stools. Above this is a horseshoe-shaped gallery with a half-moon balcony at the front, blessed with the best views of the whole property, and a reading space with a cabinet of books and board games. There are three bedrooms in the main building together with a home theatre ‘studio’ that can be used as an extra bedroom. 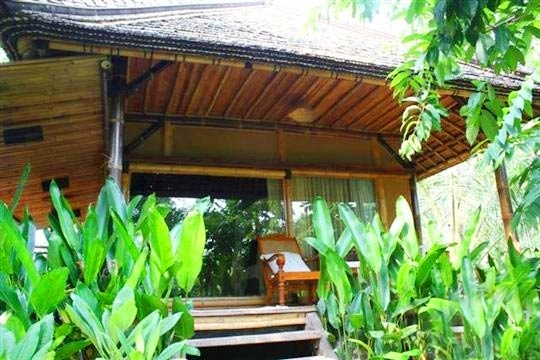 Additionally, a one-bedroom bamboo house, with ensuite bathroom and raised terrace, is set back from the main house in the 5000-square-metre garden. Each bedroom is furnished with a queen-size bed (one of which converts to single beds), and fitted with a ceiling fan and air-conditioning. 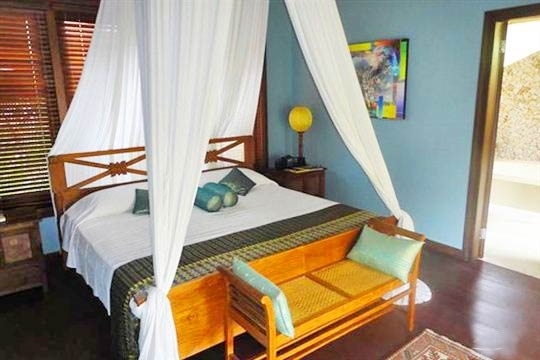 All have balconies or terraces and sunny open-air bathrooms, entered by traditional Balinese doors and fitted with monsoon showers. 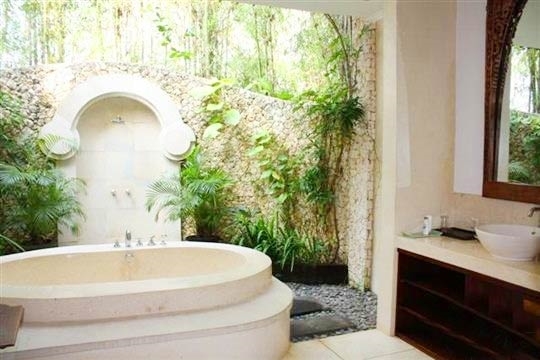 Three of the bathrooms have bathtubs, and the bamboo house has a DVD player for viewing movies on a 21-inch TV. 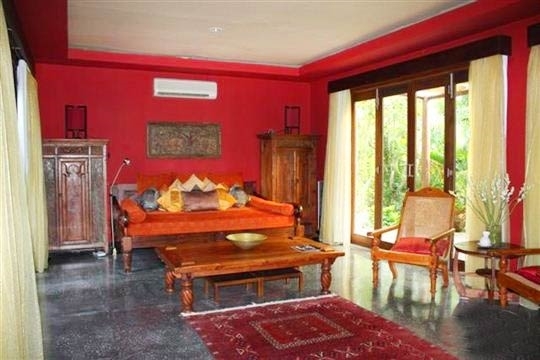 Flaunting a spicy red theme, the studio/home theatre/extra bedroom is furnished with lazy chairs, a Persian rug and a king-size daybed fitted with a deep King Koil mattress. 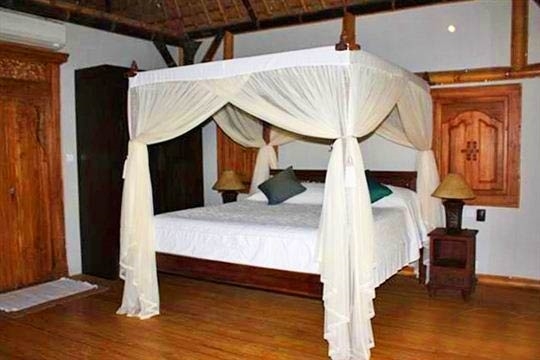 The room is equipped with a large flat-screen TV/DVD player, while next door is a bathroom fitted with a shower. 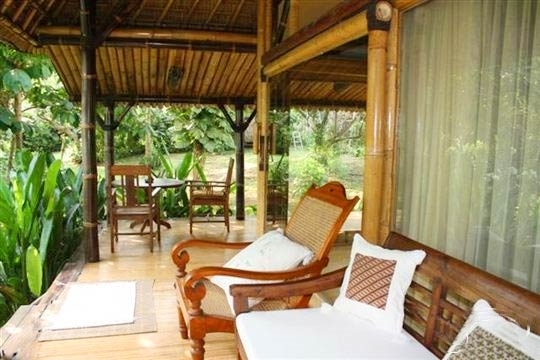 A separate pavilion houses a fully equipped kitchen and a Bali-style open-sided dining pavilion with a table for ten. In the front garden, an infinity-edge saltwater swimming pool incorporates a cold jacuzzi, and a thatched pool balé presents two comfortable daybeds adjacent to an elevated alfresco dining area, which is sheltered by a flat roof. A short stairway leads to a cliff side balé, while a flight of 120 steps leads down to the narrow sandy beach. 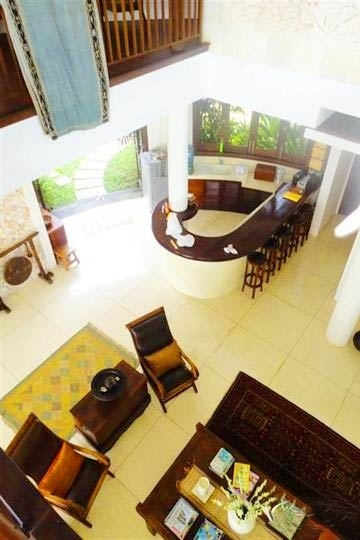 4 bedroom villa located in The Bukit, Bali. 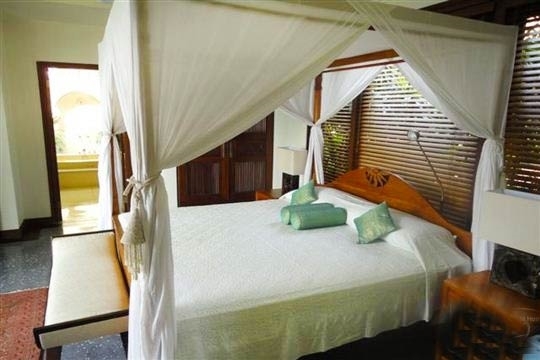 Ideal for Beachfront, Body and soul, Bring the relatives, Kid friendly, Going for golf, Fair share for groups, The great outdoors, Sensible for seniors, Room with a view, Perfect for weddings.